Little Amida Buddhas coming out of his mouth. Recollection is essential in Pure Land schools in the practice of the Nien-fo (Japanese, Nembutsu--"Recalling Buddha"). The practitioner chants Na Mi-to Fo (Japanese, "Namu Amida Butsu,"-- "Venerationto Amitabha Buddha)." At the temple Rokuharamitsu in Kyoto, you can see the image of Kuya Shonin, an early Pure Land teacher who went about the country calling out "Namu Amida Butsu." The sculptor renders him as a young pilgrim walking slightly bent over, with a row of little Amitabha Buddhas coming out of his mouth on a wire. Kuya Shonin's every breath is Amitabha Buddha. He is Amitabha Buddha recalling Amitabha Buddha. Kuuya Shounin 空也上人 or Saint Kuuya (903-72), the monk responsible for the spread of Pureland (Joudo 浄土) Buddhism among commoners in the Heian period. Born into the imperial family, but of a non-Fujiwara mother, he became a monk at Kokubunji 国分寺 in Owari 尾張 (Aichi prefecture). In 948 he received a Tendai 天台 ordination at Mt. Hiei 比叡. In the following year he began fourteen years of travel throughout Kyoto and the countryside doing good works and practicing a type of chanting using song and dance (odorinenbutsu 踊念仏). Popularly known as Ichi no Hijiri 市聖 ("Sage of the people") and Amida Hijiri 阿弥陀聖 ("Sage of Amida"). In 963 he finished copying the NINNOU HANNYAKYOU 仁王般若経 (Prajnaparamita Sutra) in gold ink, and held a dedication on the banks of the Kamo 鴨 River. With donations solicited from this event, he built Saikouji 西光寺 (also known as Rokuharamitsuji 六波羅密寺) in Kyoto. 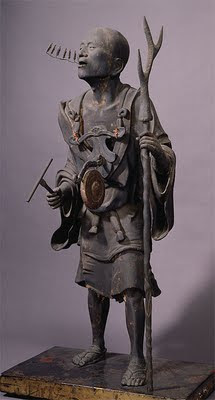 Kuuya's image is preserved there in an "imaginary portrait" sculpture made in the 13c by Koushou 康勝 (fl.1ate 12c-early 13c), the fourth son of Unkei 運慶 (1151-1223). 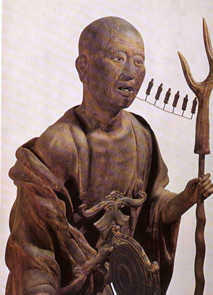 The wood sculpture shows Kuuya chanting the nembutsu which is represented by the six miniature images of Amida 阿弥陀 coming out of his mouth. 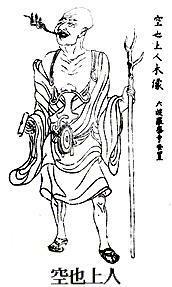 Kuuya holds a staff and gong, used to beat out the rhythm of the odorinenbutsu. The rise of Pure Land Buddhism was not merely an outgrowth of the new feudal society, translating into religious terms the profound social changes which then took place. Already in the late Heian period we find individual monks who sensed the need for bringing Buddhist faith within the reach of the ordinary man, and thus anticipated the mass religious movements of medieval times. Kuya (903-72), a monk on Mt. Hiei, was one of these. In the market places all kinds of people joined him in his dance and sang out the invocation to Amida, 'Namu Amida Butsu.' When a great epidemic struck the capital, he proposed that these same people join him in building an image of Amida in a public square, saying that common folk could equal the achievement of their rulers, who had built the Great Buddha of Nara, if they cared to try. In country districts he built bridges and dug wells for the people where these were needed, and to show that no one was to be excluded from the blessings of Paradise, he travelled into regions inhabited by the Ainu and for the first time brought to many of them the evangel of Buddhism. There is a historic temple known as Aizu Kooyasan in the Fuyukizawa area in the eastern part of Kawahigashi-town. This temple is the only one in Japan that has the custom where people put ashes of the dead into wooden "Nokotsu Gorinto" for their souls. During the Hachiyoji festival, Kuya Nenbutsu (the invocation Namu Amida Butsu)-dance starts at 10 o'clock on August 5th, in front of the Kaizandoo. Performers say a prayer to Buddha and dance. The dance expresses people's devout faith, and this tradition is passed down from generation to generation. It is said that Hachiyoji Temple was built by Kuya in the mid 10th century. It was burned in a fire by war in the end of the Civil Age. However, it was rebuilt in the latter 16th century. Hachiyoji Temple contains the Amidado and the Okunoin. A lot of wooden "Nokotsu Gorinto" were driven into the walls and ceiling of the Oku-no-in, and some of them are from 400 years ago. Hachiyooji is the only temple that still carries out the custom of people putting ashes of the dead into "Gorinto" for their souls. Hachiyoji Temple was designated as an important national tangible cultural property in 1981. In Aizu, when there is a death in a family, at the first "Bon" after the person's death we have "Aizu Koyasan-mairi" to dedicate "Gorinto" to the Amidado during the Hachiyoji festival, from August 1st to 7th. This custom still remains now, and it is a very valuable religious custom from the medieval period - to pray for a peaceful death for the dead. Kuya, who is said to have begun the Kuya Nenbutsu-dance, diffused Buddhism among the common people in the Heian era. The Buddhism world was totally divorced from them in those days. Therefore Kuya decided to preach the idea of the Pure Land to people since he had faith that everyone needed salvation from Buddha. It is said that the Nenbutsu-dance begun by Kuya was based on his own experience - he started to dance while reading a sutra because he was deeply moved with the sutra. He gathered people at every street corner and preached the idea of the land of Perfect Bliss by saying prayers to Buddha and dancing with beaten earthenware. This gave people peace of mind. The Nenbutsu-dance disappeared in Kyoto, the original home of Nenbutsu-dance. In Kawahigashi-town, it was handed down to the Fuyukizawa area in 1921 by Kuya-Koshokai of Kanda, Tokyo. Now, Kuya-Koryookai has taken over the dance. Performers wear a Buddhist priest's black robe, a stole, a Sadamori-cap 貞盛頭巾, white leggings, a pair of tabi socks and zoori (Japanese sandals). The leader slings a small gong 鰐口from his chest, has a small mallet in his right hand, and a long stick in his left hand. The other performers have small mallets in their right hands, 2 have gourds 瓢箪, 2-4 have small gongs 鉦（kane かね）, and 2 have drums 太鼓 in their left hands. The Kuya Nenbutsu-dance is a prefectural important intangible cultural asset. You can also see a video on this bilingual link. This statue is only 16 cm high. It was made in the Muromachi period. The figure is standing in a small shrine (zushi 厨子) . 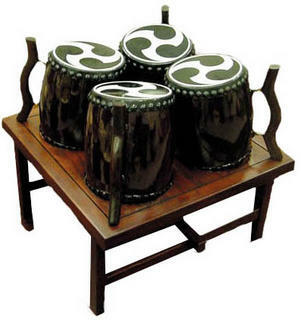 Yotsu-Daiko means a four-drum in Japanese. As literally implied, four small drums are set on a special stand with a little angle toward to the center. One player dominates the four drums while performing Rokusai Nenbutsu Odori. Rokusai Nenbutsu Odori dates back to the Heian era. According to a local legend, Saint Kuya created the chanting and dancing to spread the faith in Buddhism among the people. It gradually developed to a popular entertainment from the middle of the Edo era, absorbing Noh, Kyo-gen, and Kabuki tastes. The Rokusai Nenbutsu Odori had been performed often until the World War II broke out. After the war ended, it was revived owing to some groups and has been inherited till now in Kyoto. In 1983, the government authorized those Rokusai groups as an Important Intangible Cultural Asset. Ever Onward, Step by Step, Always Forward. Prayer Gong Cricket (kanetataki) 鉦叩, because its sound resembles the hitting of the prayer gong. This is a kigo for autumn. Tea for good luck and good health, drunk at the New Year. This tea is also related to Kuya Shonin and an epidemic in Kyoto. There are some winter kigo related to this saint. The death day of this saint is celebrated at the Kuya Hall (Kuuya-doo, Kuya-Do 空也堂 in Kyoto, with dance and hitting the gongs and drums. Look at many more photos from 2004. This Haiku was in the magazine "Taiyo - Sun" published on Dec. 3rd of 1896 (Meiji 29) and appeared in the 5th volume of Shiki's Haiku poetry "Kanzan-Rakuboku" (The part of the winter season of 1896 (Meiji 29) ). The characters on this Haiku monument was written by bishop, Hiroaki Mori, the former superintendent priest of "Kouya-san Temple". It had been said that Kuuya called the saint of Amida Buddha and stayed at this temple for three years. He was kept standing in the city of Kyoto to encourage people to say a prayer to the Amida Buddha ringing a gong and danced hitting a gourd or a bowl. This Haiku means that Kuuya's teachings have been survived still now, even though he already died. (zuda also means hachi tataki). From the 13th of November until the 31 of December, the priests and lay people of the Kuya Hall walk the streets of Kyoto, hitting the gongs and dancing. Legend knows that the samurai Taira Sadamori 平定盛 killed a deer that Kuya felt close to, since he had seen the deer every morning on his prayer rounds. Kuya felt very sad about this death and asked Sadamori to give him the dead body. He prepared a coat from the fur and used the antlers for his walking stick, thus praying for the deer every day. Sadamori was so moved that he became the pupil of Kuya, although he did not have his hair shaven and was married. He changed his name to Joosei 定盛, took a gourd, and started dancing and hitting the gourd with Kuya in the cold days of the end of the year. The grandchildren of this Joosei (Josei) built the Kuya Hall where until today the memorial services for Kuya and Sadamori are held. During the Edo period, many people prepared fermented bean soup (nattojiru) in the early morning for a hot winter breakfast.
. WKD : Nattō, Nattoo, Nattoh, Nattou - fermented beans .
. salmon, sake 鮭　.
the grave of Choshoshi ?
. Kinoshita Chooshooshi 木下長嘯子 / 長嘯 Kinoshita Choshoshi . lit. while the villagers go on with the hachitataki prayers, the local priest has gone to sleep. sainen, sainenboo 西念坊 a very normal Buddhist priest. Literally someone who constantly thinks (nen) about the Buddhist paradise in the West (sai).
. Kuuya Shoonin 空也上人 Saint Kuya (903-72) . with his walking stick of deer horn. kasezue 鹿杖 "walking stick of deer horn"